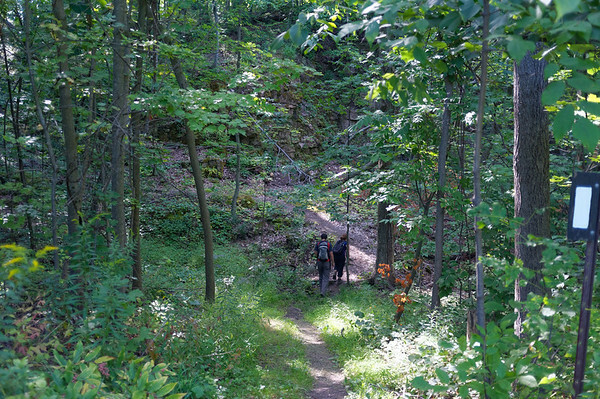 I often am asked what it’s like on the Bruce Trail. The only answer I have for those who ask me is that I really never know what to expect. Sometimes you find yourself in a middle of a quiet and tranquil forest, other times you’re walking down an empty country road next to fields of harvest, and then suddenly you find yourself in the hustle and bustle of city life. 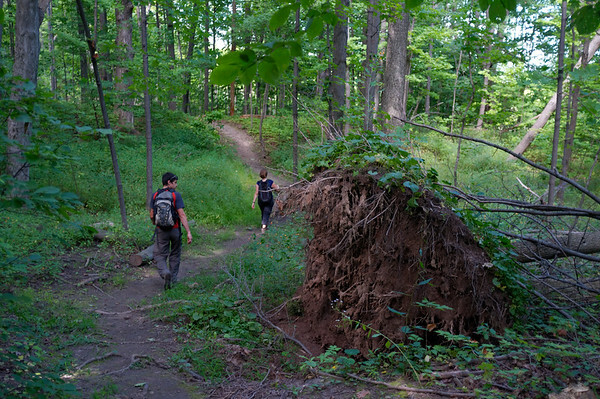 After our rather exciting last hike through Hamilton, I was looking forward to this upcoming section of the Bruce Trail. 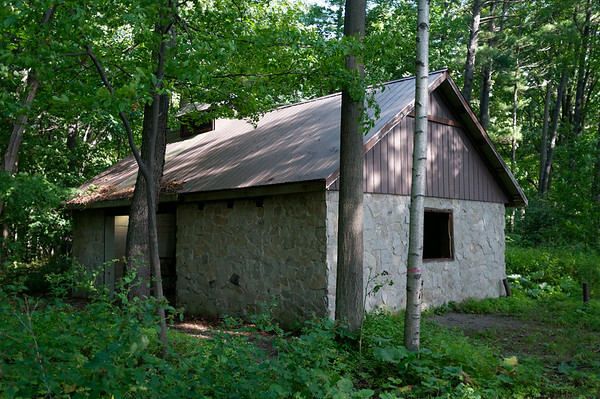 Starting where we left off on Sydenham, we immediately stepped into the forested escarpment overlooking the city. 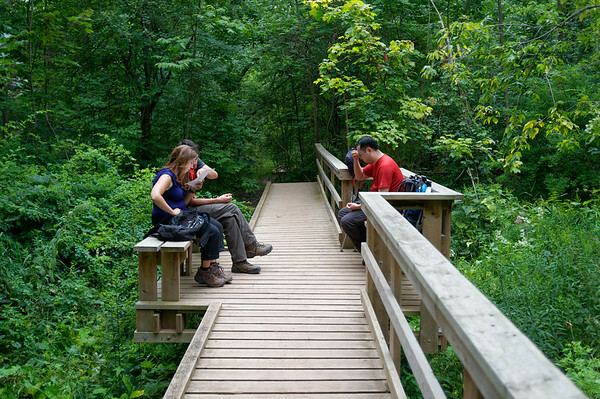 I often am asked what it’s like on the Bruce Trail. The only answer I have for those who ask me is that I really never know what to expect. 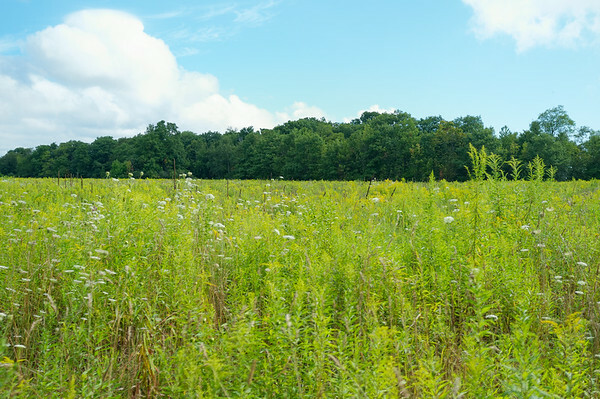 Sometimes you find yourself in a middle of a quiet and tranquil forest, other times you’re walking down an empty country road next to fields of harvest, and then suddenly you find yourself in the hustle and bustle of city life. It’s rather odd but I think it’s one of the things I enjoy most about this extensively long trail. Still so much to go. It’s pretty bizarre how often we hike from one landscape to a completely different one. I often wish I had more time to sit down and watercolour sketch some of the things I’ve seen. The diversity I see makes me feel very fortunate to have the opportunity to tackle such a tremendous challenge. It isn’t easy to find friends who have common goals and similar interests and for that I’m grateful. I doubt I’d be able to do this on my own. 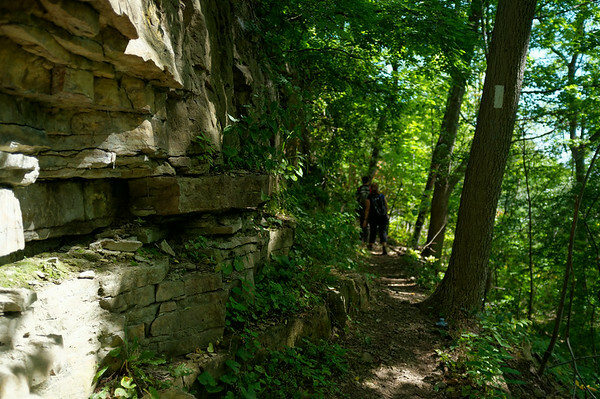 As I had mentioned earlier in this post, one of the unique things about the Bruce Trail is where you will find yourself. 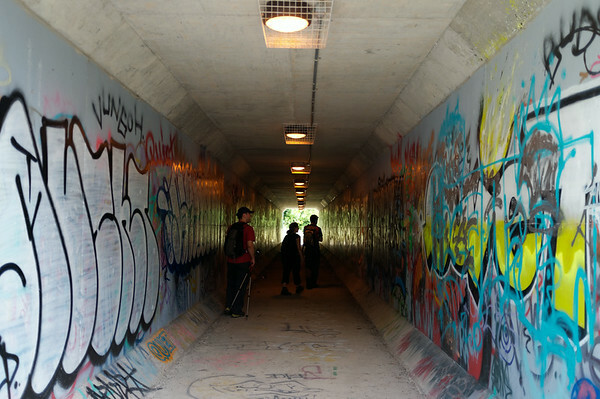 Here we end up hiking under Highway 403 where a tunnel is completely covered in graffiti, although I am curious if some of these guys will end up tagging the ceiling. I figure it’s a bit more challenging to carry a ladder around! 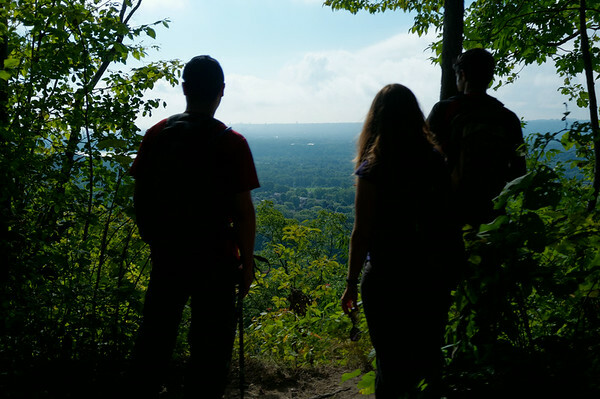 I have to give a lot of kudos to the Bruce Trail Association and the volunteers. It must be a ton of work to lug all the material to the site and build a very nice bridge over a river. Not only is it well built but it’s got some conveniently-located seating too. Perfect for lunch! We had initially stopped at a nearby pond with swans and geese but we caught a whiff of sewage and that wasn’t too appetizing. 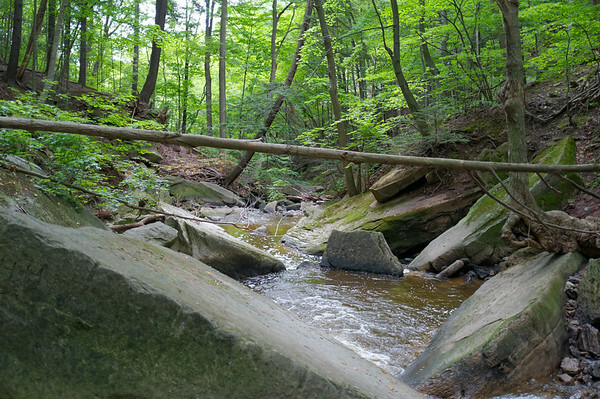 After lunch we push forward and find ourselves hiking up a section of the escarpment leading us to an area called Smokey Hollow and in the park area we found Grindstone Falls (aka. Great Falls, but what a bland name). 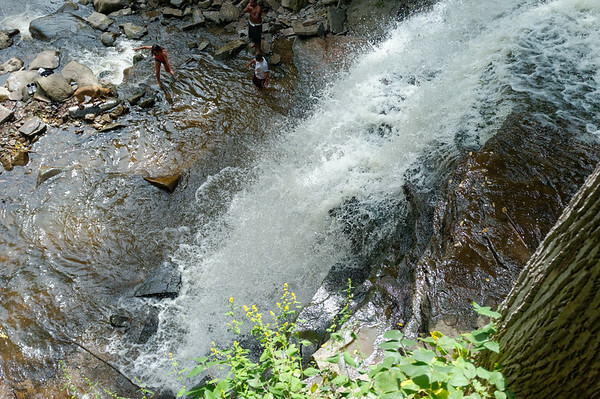 We were only looking over the falls but there seemed to be a lot of youth enjoying their remaining days of summer vacation at the base of the waterfall. I envy them to some extent, to have such an awesome natural wonder in their neighbourhood. Didn’t really have that when I was growing up in a suburb of Toronto, and the Don River doesn’t count! 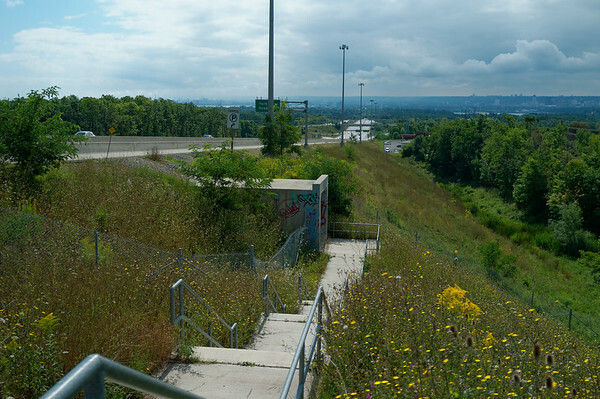 After some more ascents, passing through residential areas, and enjoying some decent views of the city of Burlington (we could see the Skyway bridge), we found ourselves in a bizarre predicament. 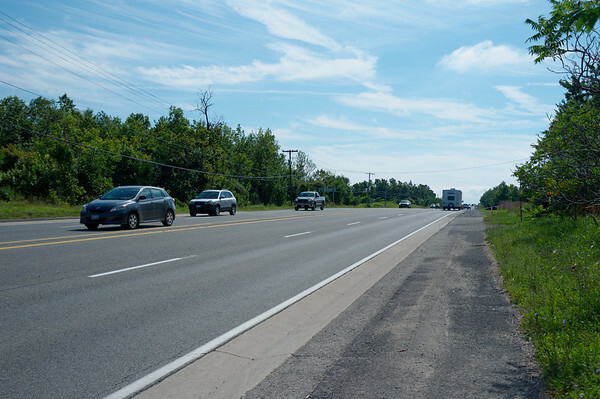 We had to cross Highway 5 (or now called Dundas Street). This was a pretty hazardous and difficult task considering how much traffic there was in the early afternoon. 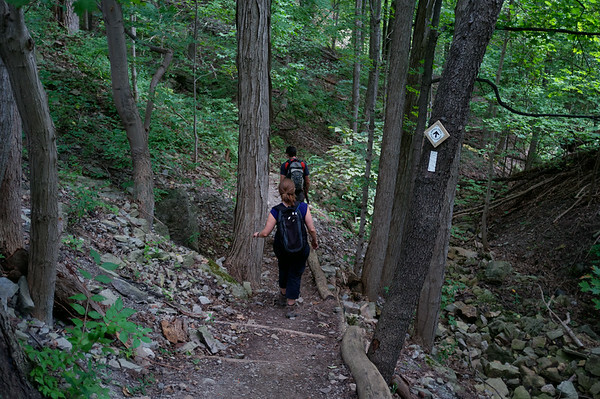 Unless the Bruce Trail Association is planning to build a bridge or tunnel soon, I would recommend tackling this part as early as possible in the morning when there is less traffic. We fortunately found a gap in traffic to run through. Sometimes it’s amazing what you find in nature. The opportunities for juxtaposition are quite common. Also brings to mind how powerful of a force nature. 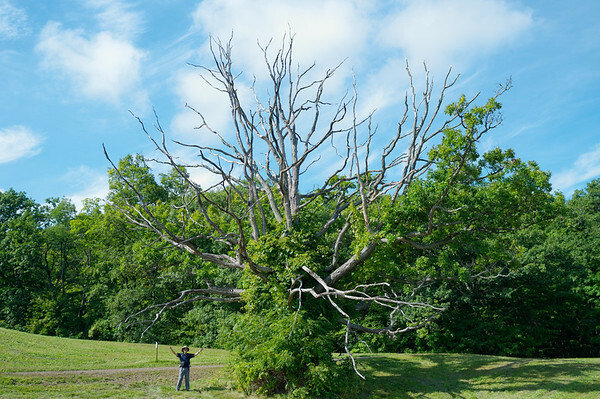 Few things bring so much awe as a large tree uprooted by a storm, few things bring such a unique form of joy that comes from seeing a tree with so much character and history. Of course my friends and I ended up spending time walking around it and taking photos with it. This was another place I wish I could sit down and sketch. It seemed so magical and it was in the middle of nowhere (in a manner of speaking). I wonder if this tree receives a lot of visitors. 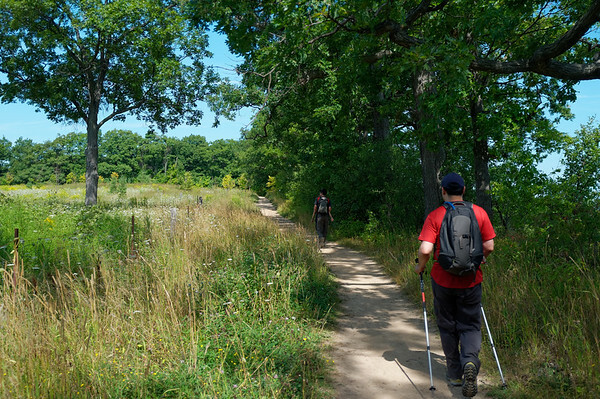 We made some major progress on this section of the hike — finally crossing into Burlington. Not as exciting as our previous hike but we had the opportunity to enjoy streams, waterfalls, and some pretty good views. As the weather gets cooler and we make our way further and further away from the city, my friends and I have been discussing how to manage the future hikes because we will likely need to tackle a few days worth of hiking at a time rather than the approximate 20km or so that we’ve been working on. Will post on that later. You can find the full gallery from this hike here. Stay tuned for the next section!